Nordlaks was established in 1989 when Inge Berg bought its first aquaculture license at Hanøya in Vesterålen. Inge had a degree in aquaculture and worked as a manager at Stø Fiskeopdrett (“Stø Fish Farming”). He saw the opportunity to build something himself, and despite the small initial capital, he was able to buy the farm at Hanøya from the bank. At that time, most of the work was done by hand and the technology was simple and mostly homemade. The total production during the first year of operation was no more than 150 tons, a volume slaughtered during less than one shift in today’s processing facility. This was the start of a self-made industrial group born by a true entrepreneur with a huge eagerness to build lasting values from the natural and human resources in his home region. Nordlaks Smolt in Mørsvika, Sørfold. Nordlaks recognized early the importance of controlling the most important input factors ourselves and started in 1992 our own stocking fish production. Today Nordlaks have three land based stocking fish facilities in the region. The so far latest facility, in Mørsvika in the municipality of Sørfold, was completed in 2011. The facility set a new standard in Norwegian aquaculture industry in the areas of biosecurity and technology. Today, Nordlaks is building a new smolt facility at Innhavet in Hamarøy municipality. The RAS facility will be the largest smolt facility in Norway when finished in 2019. VAP production at Nordlaks Produkter, Børøya. The salmon processing plant at Børøya was also established in 1992, temporarily in a rented facility, before Nordlaks started again in its own premises in 1996. From only slaughtering and packing fresh salmon in ice-cream parcels, Nordlaks started production of value added products in 2001. In 2012 it was time for a modernization and expansion of the fillet factory. Although it is difficult to compete internationally with processing based in Norway, such production is important for Nordlaks in terms of local employment and activity based on our own resources. In addition to keeping and building competence within product and market development. From Børøya Nordlaks sell high quality products to demanding customers mainly in Norway, Europe and the United States. Nordlaks has often been, and strives stay at the front of the development of Norwegian aquaculture. One example is from 2007, when the company designed and installed the world's largest spiral freezer (IQF) for whole fish. Even today IceBerg is a sought-after brand with its unique quality due to quick and gentle freezing of whole and even large fish. Inge Berg has always been keen to utilize all the resources in the value chain. No potential valuable resources should go to play. In 2009 we started producing oil of by-products from the processing activities. The high-quality oil is used in both animal feed and for direct human consumption as dietary supplements. Many raised their eyebrows when Nordlaks ordered the world's largest wellboat back in 2010. Bristling with new technical solutions and the latest technology, BB Bjørg Pauline came home to Vesterålen. 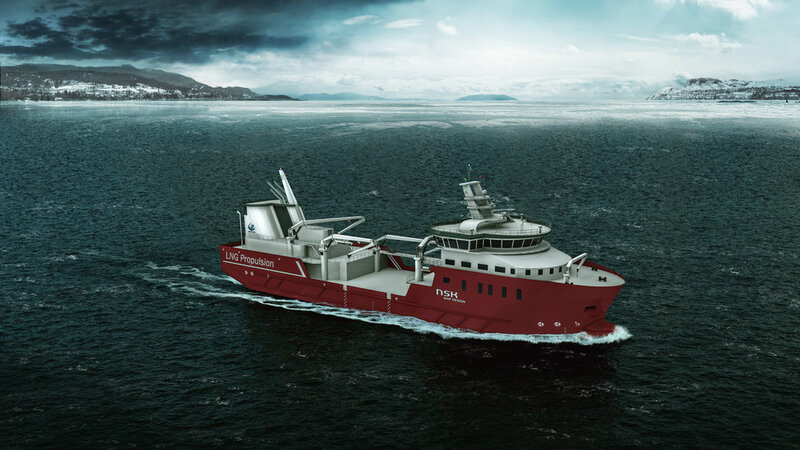 In 2020, Nordlaks will recieve yet another “worlds first” wellboat, with hybrid/LNG based propulsion. New technology cuts the CO2 emissions by 30 % and NOx emissions by 90 % compared to traditional technology. Nordlaks supports the recruitment of the next generations of employees and entrepreneurs to the aquaculture industry. Nordlaks views education and general knowledge building about aquaculture as part of our social responsibility. In 2011, we established Aquaculture in Vesterålen, which is Nordlaks display and learning centre. Both locals and tourists visit to learn more about the company and the Norwegian aquaculture industry in general. Nordlaks also collaborates closely with schools and kindergartens in the region, including the local high school for providing the students with relevant and updated education and relevant experience during their studies. Our vision of the future is moving closer. We believe that the key to sustainable development of the industry lies within the ability to utilize new sea and coastal areas for food production. Inge Berg had his first ideas about the “Havfarms” in 2015. The development of the “Havfarms” is an innovation and research boost for the whole aquaculture industry, while at the same time giving our region a significant economic boost. In 2017, Nordlaks were granted 21 development licenses from the authorities. Enabling Nordlaks to delve into the largest and most ambitious development project to date. In total, we will invest 2 billion NOK in the Havfarms and another 1-2 billion in other activities to prepare the whole company for the future. The Havfarms are an important part of our future production strategy; the Nordlaks model. From the beginning, Inge and his colleagues built Nordlaks step by step. Inge dare to think big and dare to take calculated and ambitious risks. Virtually all the money the company earned have been reinvested in the future of the company. Curiosity, competence and strong focus on the future, blended with a strong wish to build something himself and a bit of luck, are among Inge's main characteristics. And Nordlaks’ success recipe.